Today marks 37 years since toddler Katrice Lee went missing in Germany where her father from Hartlepool was stationed with the British Army. Richie Lee, 69, of Belle Vue, has not seen his daughter since she vanished from a NAAFI shopping complex in Paderborn on her second birthday on November 28, 1981. 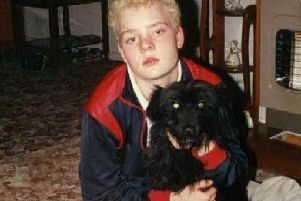 Her family believe Katrice was abducted to be a surrogate child for another family and have been appealing for information about what happened to her ever since. Earlier this month, Richie's other daughter Natasha got married when she wore a button from a red coat belonging to Katrice. Richie said: "November for me is a horrible month because Natasha got married without her sister being chief bridesmaid. "My birthday was on the 21st, my two twin nephews were born on the 28th of November so that's very poignant as well, and of course it is Katrice's birthday." Katrice's family and friends are once again using the anniversary to raise awareness of her case including sharing pictures on social media of what Katrice may have looked like as she got older. Richie added: "Without the information being in the public domain, how does she know that she is missing? "I have got to believe that and I do believe it." Katrice's case was given national and international attention earlier this year when investigators carried out a large scale dig at a riverbank close to where she disappeared. Katrice Lee as a toddler just before she disappeared. After five weeks, no trace of her was found. Richie previously described visiting the area again as like "walking back into a nightmare". But he said it allowed him to raise awareness of Katrice's 'lazy' left eye she had as a child which would have needed two operations to correct, one as a small child and another as a teenager. Supported by Hartlepool MP Mike Hill, Richie has had two meetings this year with Defence Secretary Gavin Williamson as Richie tries to ensure Royal Military Police investigators follow up all possible lines of inquiry. But Richie has become increasingly critical of investigators' handling of the case citing a lack of communication with the family and not being given access to case files he says he was promised. It has led to him engaging a top barrister John Cooper QC to represent the family.